After winning the Grand Prix qualifier, Eichendorff also won the Special of the CDI3* in Stadl-Paura. 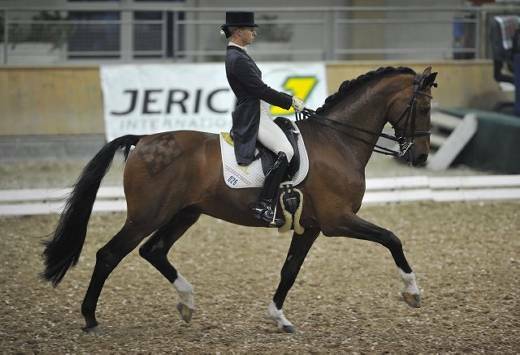 Eichendorff had a spirited, expressive ride in the Grand Prix and the judges rewarded him with 71.40 percent. In the Special were were even better and Eichendorff won with a great 72.47 percent. Second place went to Benjamin Werndl/GER on Der Hit (71.45 percent), third place to Karen Tebar/FRA with Don Luis (71.39) and fourth to Stefanie Weihermüller/GER on Wunderkind (70.05). In their first international Grand Prix together, Stefanie Palm achieved eleventh place after a great ride on Royal Happiges OLD, a horse she trained herself. Places 13 to 15 were taken by the Austrians Amanda Hartung with Wolkenritter, Nikolaus Erdmann on Vienna A and Jasmin Jaklic with Insider. Eichendorff's very consistent performance made me very happy: He had already been nicely concentrated and highly motivated at the show in Graz and was just as fantastic now with a double victory in Stadl-Paura.